In this rare defect, the pulmonary valve, through which blood is pumped by the right ventricle to the lungs, is largely absent and leaks. Absent pulmonary valve in isolation from other defects is rare. The most common associated defect is tetralogy of Fallot. It may also occur with ventricular septal defect, abnormal tricuspid valve, double outlet right ventricle, and atrioventricular septal defects. The absence of the pulmonary valve results in a spectrum of mild to massive dilatation (enlargement) of the pulmonary arteries (2 in diagram at left). 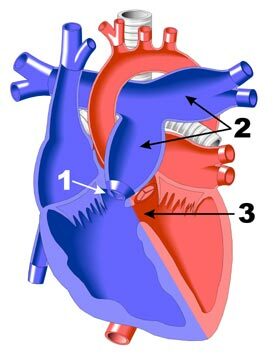 In addition, there may also be a large ventricular septal defect (VSD), or hole in the dividing wall (septum) between the right and left ventricles.